History: The nusery was built in stages since then on the FitzGerald family farm in Co. Kilkenny Ireland. The farm land has been farmed by the FitzGerald family since the 1700’s and was a typical traditional farm of the time containing aproximately 100 acres. In the centre of the nursery activity is a well preserved neolithic ring fort or in Gaelic (Rath). This is the remains of what was probably the first agricultural activity by the Celts on this farmland. Patrick FitzGerald diversified from the traditional Cattle, Dairy and vegetable enterprises to focus mainly on nursery production. 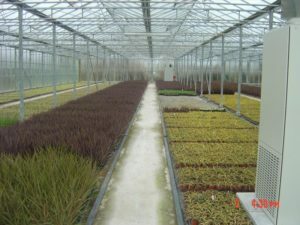 He established the nursery and specialized in the production of young plants for sale to growers in Ireland at first and now 18 countries around the world. Description: FitzGerald Nurseries sell young plants in 18 countries as plugs, liners and stage three tissue culture plants. the company is interested in developing volume contract produciton in each of these categories. From simple product development and marketing starting in 1994 the company is now to the forefront in developing exciting plant ranges for the future. In December 2004 FitzGerald Nurseries took over Plant Technology Ltd Irelands only commercial plant tissue culture laboratory. With a staff of 15 the laboratory now produces exclusively for FitzGerald Nurseries and takes on contract propagtion for select clients. The focus of the laboratory is on novel and licensed plant varieties with a very special emphasis on foliage plants for outdoor garden and patio planting. During 2005 further work on formalizing the structure of the nursery product development was undertaken. In 2009 planting has begun on the new trial and display gardens.